The Premiere Houston Demolition Contractor Says "Hi!" 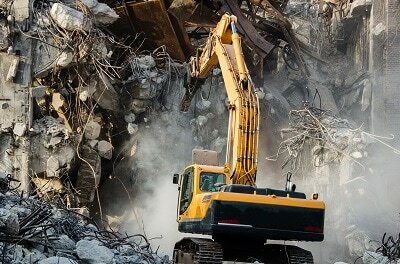 Houston Demolition is not your common sloppy, reckless, late arriving and irresponsible demolition contractor. We care about everyone in need of demolition services in Houston, TX regardless of building size, deconstruction preference, or budget. And since we offer residential & commercial demolitions, we work with both commercial building owners and your regular home owners. So, if you are tired of the arrogant demolition companies in Houston, not willing to even look at you, rest assured you will be heard here. 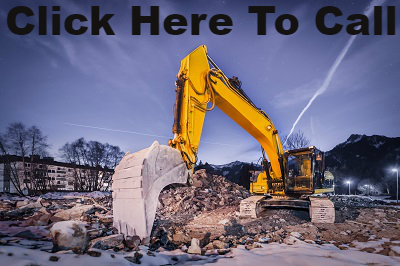 On top of that, you will also get the best results you could possibly dream for, since we strive to be the #1 demolition professionals in the state of Texas. And you will be happy to know that in over 20 years of doing this, we haven't had a single significant accident or legal situation. In fact we have workman's compensation and liability insurance at $1,000,000 coverage. Companies like Robert's hauling & demolition Houston TX or Cherry demolition Houston are okay companies. But that is pretty much it. Not to throw any mud into their faces, but they don’t have the decades of proven experience we have in the demolition and deconstruction business. I guess if you are looking for an average demolition group to take care of your duplex, they are okay. But if you are looking for much larger and more difficult work that needs to be done, then we pretty much blow them out of the water. Because not only do we have the “know how” but we are also very discipline and professional. Due to the fact that we are always working on some deconstruction job, we get to basically experience all sorts of buildings and that builds a diverse experience background that allows us to carry on with more technical projects. Also, the fact that we can demolish a building with a variety of approaches, gives us a lot of flexibility. So for example you may have the building in the center of the city, where you could not get an implosion permit. We are able to go in with our bulldozers and excavators and start tearing it down piece by piece, without damaging neighboring buildings. Or on the other hand, if you are at a wide open area, we can move along a lot faster with an implosion. 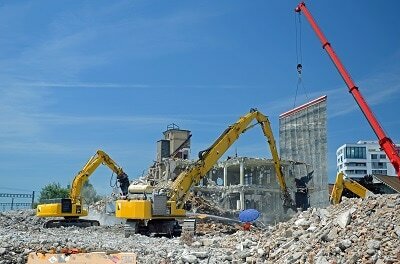 We are the Mercedes of demolition: fast, reliable and with a great engineering approach. Not only are we very good at what we do, but we also work well with other people that may also be working on your property. For example, when we leave, we make sure what we left behind is appropriate for construction. So we pick up all the debris, concrete and broken prices of the building so that the next company can come in and go right to building the foundations for the new building. Also stones, dirt, bricks, reclaimed asphalt pavement etc can all be recycled and re-used on the same property. So make sure we do that, in a spirit of sustainability. Demolition in Houston isn’t always expensive nor does it have to be. 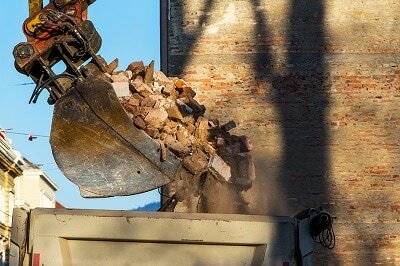 There are a lot of local demolition companies that will give you a quote that is astronomical and without a great reason behind it. Can I let you in on a little secret? Most companies try and get involved with other work such as recycling, construction, or bring in special equipment for debris cleanup that drives up their costs bigly. So in other words, when they can’t book those jobs, they need to make up for the insurance they pay for the vehicles and the salaries for the workers that are standby etc. We have very sustainable overhead directly related to your job, and that allows us to stay competitive when we do our demolition bids. Not only do we have the greatest equipment and the most updated fleet, we also have amazing people working here. We do not just randomly select our workers or heavy equipment operators, but rather go through extensive interviews and a lot of training. Only when we feel someone is qualified to hit the deconstruction site, does he/she ever set foot there. As a result of that policy, house demolitions and all building demolitions are done in a spectacular and very safe way. 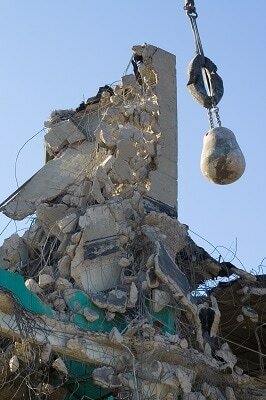 Imagine having a reckless crane operator swinging that wrecking ball in the air, damaging other surrounding properties. Not here…everyone is held accountable for every step of the deconstruction process. Everyone can pretty much toot their own horn though, right? So that is why you should contact us and even visit us at our offices in downtown Houston . 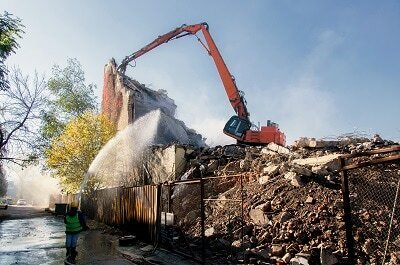 We have a great vast portfolio of successful demolitions that have been documented and you can have a look at. On top of that, you can always reach out to our clients and ask them for yourself about our work. Want to know how it gets better? We are a green demolition company that really cares about taking care of the environment and lightening the burden on our planet. 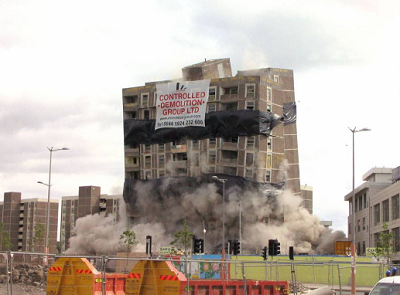 As mentioned, we won’t limit you to only one type of demolition. We pretty much can take care of any building or home and make sure it is deconstructed in an efficient and timely manner. 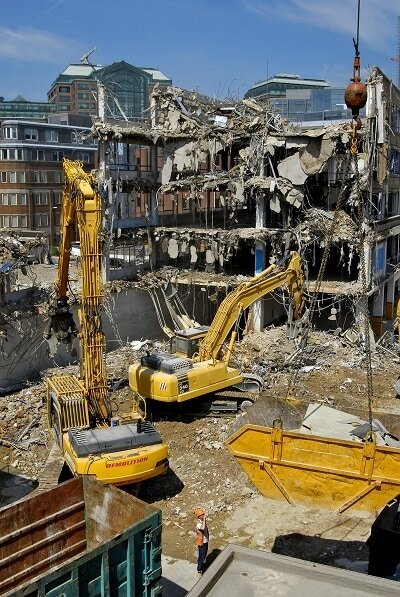 But of course if you need selective interior demolition for malls, schools, offices, homes, buildings etc then we have special equipment for that. 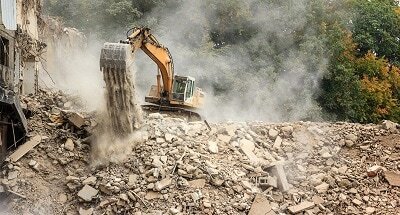 Aside of the basic activities that take place on a site, our demolition crew takes care of concrete breakdown & removal, debris cleanup and land cleaning, land leveling and even onsite excavation. So you pretty much have everything you would need just by using one deconstruction company. Not only that, but everything is done in a very safe manner. To us, safety of both our workers and the people around the property (including surrounding buildings) comes first. 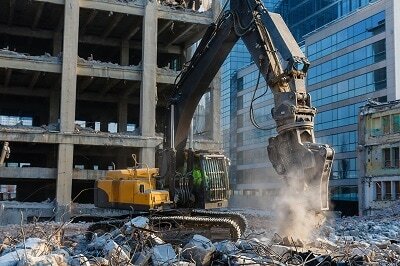 Other work we do that requires the specialty of our demolition engineers is sewer & water, emergency services, garage demolitions and construction. We even do pool removal in Houston & fill in. So, whenever you are ready to move forward and decide it’s time, call us for a free estimate or request a free demolition quote directly from our website. If you need to review a couple of examples of our work, feel free to browse through all the pictures on the site depicting the greatest commercial and industrial demolition contractors in action. So make sure you talk to us and we will come out to the property in person with all the demolition experts and engineers to provide you with an accurate and precise estimate. Not only that, but we will also walk you through the steps of getting this done and even after we get on the same boat, keep you informed all throughout the process. Trust one of the the greatest demolition contractors Houston TX has to offer!